He carelessly has no photographs on his Farcebook profile. The rest of the committee carelessly have no humorous photographs of him. notice the complete lack of drop shadow. I don't like writing HTML by hand. No HTML in site sight. Editable in a text editor. Actually, you can also extend it in any language that can do XMLRPC. 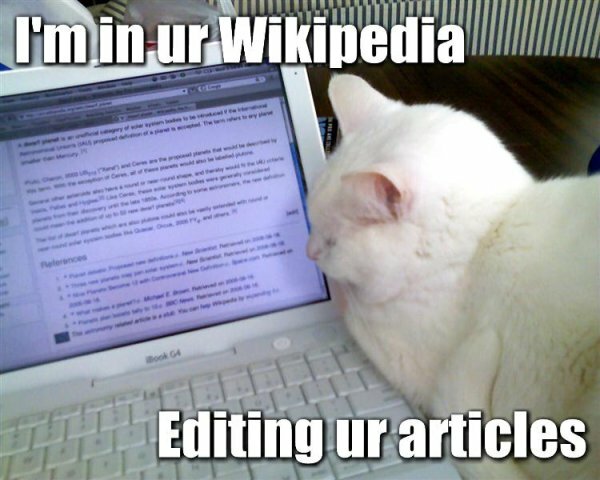 I like [lolcats] and [ikiwiki]. Upstream recommends git, but git is insane. Mercurial is supported, but I can't figure out how to add commit hooks. 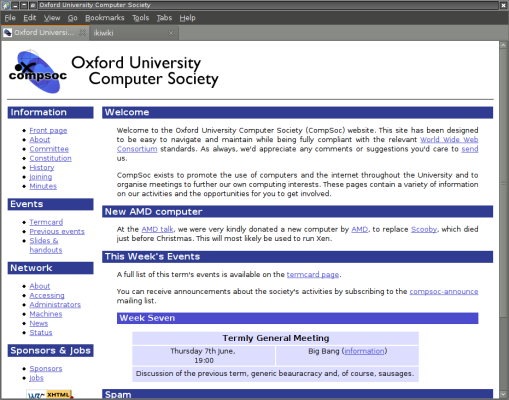 Compsoc one uses svn too. % svn mkdir file://$REPO/trunk -m "create trunk"
% svn co file://$REPO/trunk . % svn commit -m "initial import"
% why are you reading this? % you should be listening to me !!! 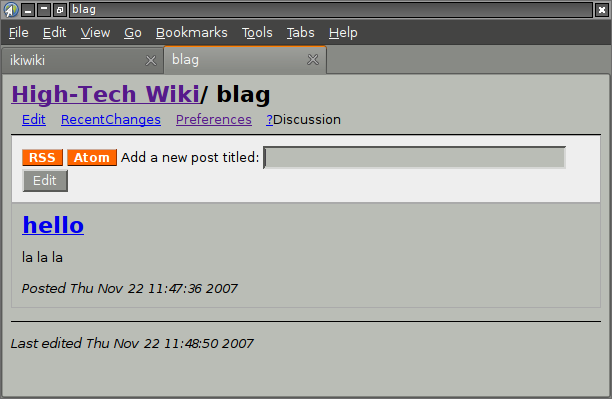 % svn ci -m "this is a helpful commit message"
and the wiki is magically updated! Web edits get committed too. 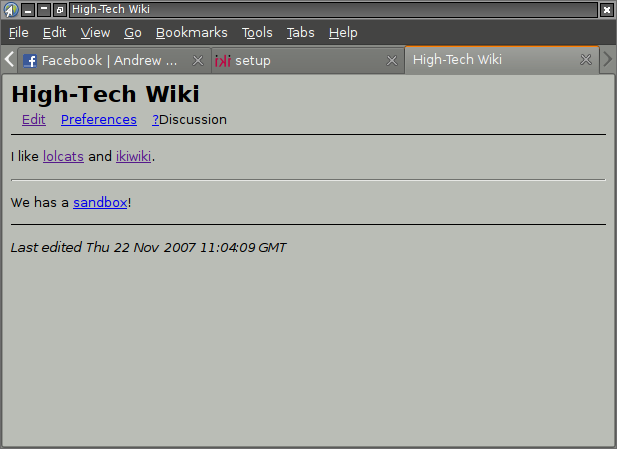 You can set up an in-browser history viewer. We use a variant on this for termcards. 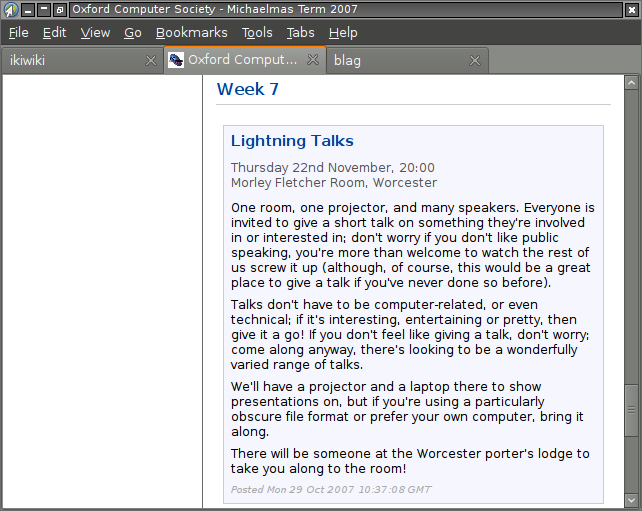 [[event venue="Morley Fletcher Room, Worcester"
No more editing HTML tables! but computers can “automate” things apparently? Give me Template Toolkit any day! 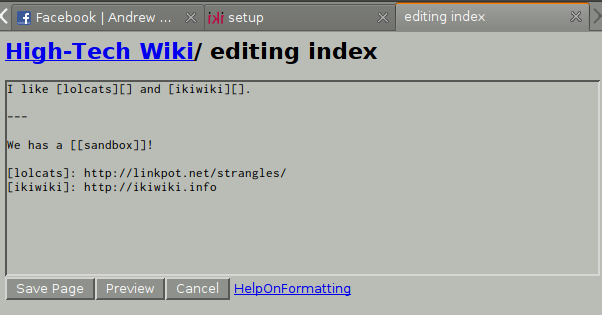 Also notice: Iki is generating HTML and stuffing it in a variable! Because it's a compiler, dynamically generated pages are hard. We have some hacks for the machine status page. In general, if you have a page that should change daily, you set up a cronjob. Someone remind me to set that up for the front page. You can do *italics* and **underline**. I actually wrote this presentation in Markdown! You can do italics and underline. For bonus points, it's written in Haskell! ~~Strikeout~~  Let's have a footnote[^1]. It also does tables, but why would you do that? !